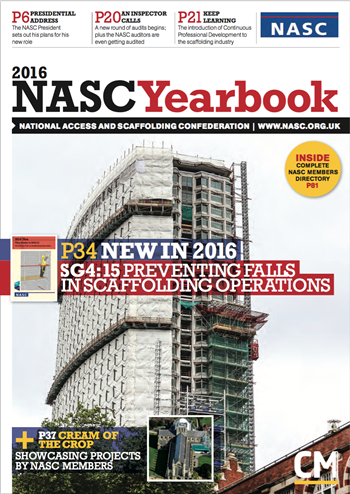 The eagerly anticipated NASC 2016 Yearbook has launched – loaded with 96 pages of UK scaffolding news, Britain’s biggest and best project reports and crucially, details of the impending launch of the NASC core scaffolding fall prevention guidance, SG4:15. The flagship safety guidance note SG4:15 is described in the Yearbook as “evolution not revolution” and features a broader scope to reflect a significant increase in the number of TG20 compliant scaffolds, changes to scaffolding good practice and innovation in the industry. In addition, NASC Managing Director Robin James reports on an upturn in the scaffolding sector, the impact and influence of the NASC’s TG20:13 good practice guide for tube and fitting scaffolding and innovative eGuide, the revised SG4:15 Safety Guidance and the forthcoming election of a new NASC President. NASC President elect, Alan Lilley reports on another busy year chairing the Audit Committee – when even the auditors themselves have been audited – and talks about plans for his forthcoming Presidency, including his intention to increase the profile of the confederation to the construction industry, especially amongst the smaller scaffold companies in the UK. Meanwhile, there’s also coverage of the outstanding achievement of outgoing NASC President, Kevin Ward – whose New Apprentices Challenge has created more than 400 scaffolding apprentices, and raised thousands of pounds for the Teenage Cancer Trust. The 2016 Yearbook also features a number of articles from the Chairs of NASC standing committees (Training, Audit, Health & Safety, Technical, Hire & Sales and Contracts) as well as listings and updates on CISRS training and SAEMA (Specialist Access Engineering and Maintenance Association). Also included in the NASC 2016 Yearbook is detailed information about the confederation and who’s who in the organisation. And there are details on how to become an NASC member/membership criteria, a list of current NASC publications, the NASC Code of Conduct, and a fully documented listing for all 260 NASC Full Contracting, Hire & Sales and Information members. The NASC 2016 Yearbook has been designed, edited and printed by Construction Manager publishers Atom, with an evolution of the re-design and new look introduced in 2015. This re-vamp incorporates a striking cover and contents page, a complete overhaul of the information sections and committee listings, together with further improvements – including a fully loaded Project Reports section. Robin James said: “With the 70th anniversary, the launch of SG4:15, a new President in Alan Lilley and continued growth and innovation within the scaffolding sector, it’s very promising stuff for the confederation and its members in 2016 – as reflected in the contents of the 2016 Yearbook; surely a ‘must-read’ publication for anyone in the scaffolding and construction industries. “The bold new design introduced last year went down very well and is equally eye-catching and easy to navigate this time around – not to mention packed with an outstanding array of scaffolding projects by members, scaffolding content, news, opinion and advertising by the membership. “Despite the fact that we live in a ‘digital age’ this publication seems to improve with every year. It’s clear that people still like to have a copy of the NASC Yearbook in their hands to read at their leisure. And again, the NASC Yearbook testifies to the unique skill set and versatility of NASC contracting members across the UK, with phenomenal projects on display. In addition to the 96 page printed version, an e-reader version of the NASC 2016 Yearbook is available to view here and via the NASC website home page.